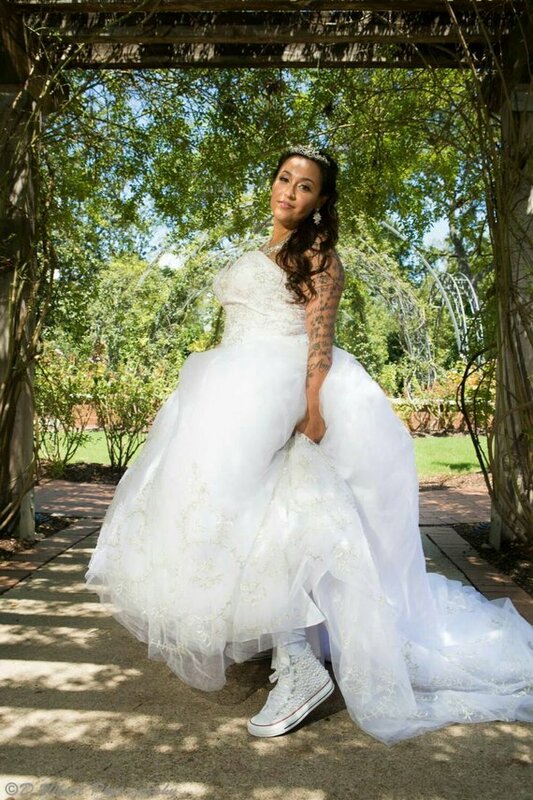 While you should consider your wedding gown’s length while choosing your shoes, it’s more advisable to first choose the shoes and then adjust your dress’s length accordingly. Make sure you can walk comfortably and easily without tripping on the hem. Also consider beading and other embellishments on the shoes which may get caught with the bottom of the dress, causing a tear or snag. You may be in love with your skyscraper heels while going out with your friends. 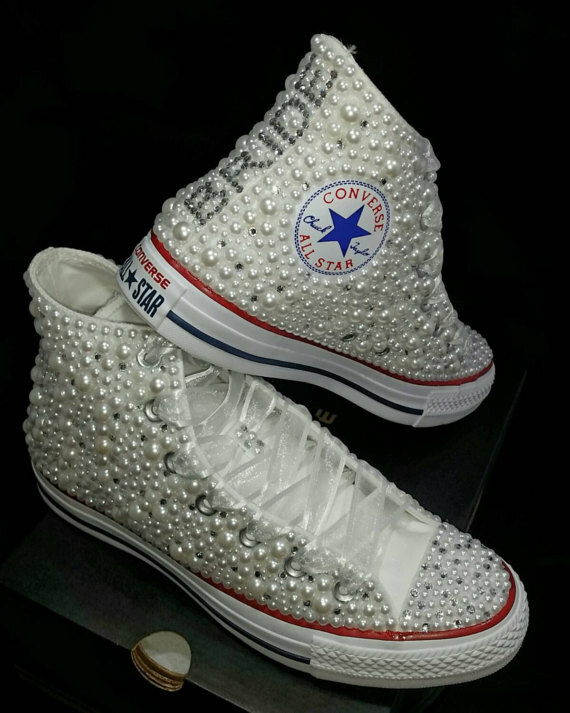 But you may have to avoid the temptation to wear them on your big day. Keep in mind that your shoes will be on your feet for almost twelve hours and you will have to do plenty of dancing and standing. You will have to maintain a balance during your vows, and most importantly you don’t want to look taller than your partner. It’s not necessary that only high heels look great on a bride. 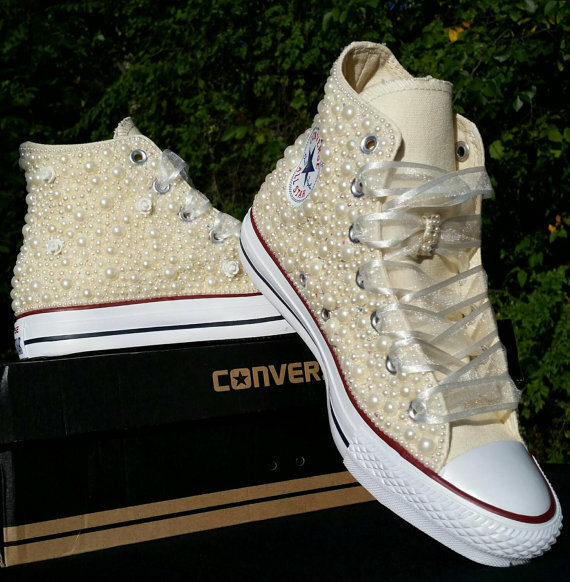 Even you can get some stunning flats like these Converse Bridal Sneakers, embellished with high-quality crystals and pearls of all sizes. They are 100% customizable too. Get the heels personalized and make a statement! 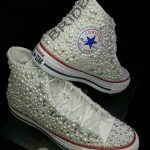 Some of the photos of these wonderful sneakers are given here and you can see many more on the website. All in all, these flat wedding shoes are no less than high heels and are perfect for your big day and are comfortable too to wear throughout the day. If you can’t decide about whether to choose the fashionable high heels or the comfortable flats, why not get both of them? There would be some moments during your wedding where you’ll have to use your feet a lot e.g. while dancing, when you can wear the comfortable flat shoes. And whenever you can’t live without the high heels, you can wear heels. Avoid blisters and other wounds due to new shoes by breaking your new shoes in by wearing them a few weeks before your big day while moving inside your house. Still if they bite, you can apply cushioned blister plasters on the right spots and be at ease during the big day. Take the time to find perfect wedding shoes and they will make you look stunning just as you want to.